At the start of each session, have your presenters display an instructional slide that informs attendees how to access Conferences i/o. Make sure the URL for your application is clearly visible to the audience. We’ve even created some template slides that you can customize and provide to each of your presenters, or insert into the start of their presentation decks. This is a crucial part in the process… As the instructional slide is being displayed on screen, have each presenter or moderator take 30 seconds to get the audience’s attention and make a quick announcement, encouraging them to participate. We’ve even provided a template script that you can follow (below). “Welcome everyone. We’re going to be using a great tool called Conferences i/o that will allow you to interact with us during the [event / session]. If you have a mobile device (smartphone, tablet, laptop, etc.) please take 30 seconds right now, take out your device and go to [INSERT CUSTOM URL]. The URL is also being projected on the screen at the front of the room. Getting everyone’s attention with the verbal announcement is critical. Giving attendees the verbal call-to-action to ‘go to the app right now‘ will have a drastic impact on participation, compared to simply displaying the instructions on screen. We’ve also created a short ( < 2 minute) Instructional Video that walks through how each feature works, and encourages attendees to participate. As a supplement to the verbal announcement you can also play the Instructional Video at the start of each session. If you’re providing informational folders or brochures to attendees, include instructions on how to log-on to the app inside the folder. You can print the instructional PPT slide and use that as the content for the handout. Send an email to attendees prior to the event, explaining what Conferences i/o is and how it works. A link to the attendee instructional video (mentioned in #3) works well for this purpose. 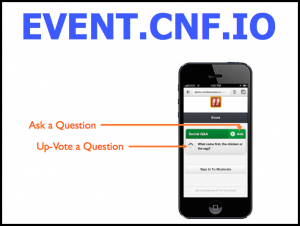 Provide the attendees with the link to your Conferences i/o app and encourage them to bookmark the link, or save the page to the home-screen of their mobile device for easy access once they are on-site at the event. If you’re using Twitter for the event, send out a few tweets with a link to the App URL and append your event’s #Hashtag.